De novo expression in the kidney of periostin, a protein involved in odontogenesis and osteogenesis, has been suggested as a biomarker of renal disease. In this study, we investigated the mechanism(s) of induction and the role of periostin in renal disease. Using a combination of bioinformatics, reporter assay, and chromatin immunoprecipitation analyses, we found that NFκB and other proinflammatory transcription factors induce periostin expression in vitro and that binding of these factors on the periostin promoter is enriched in glomeruli during experimental GN. 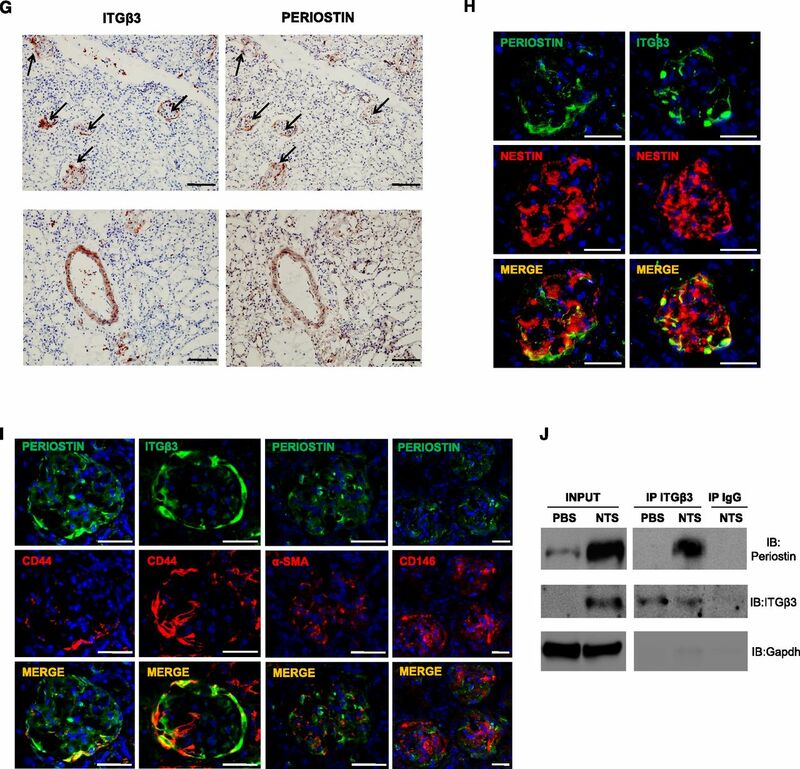 Mice lacking expression of periostin displayed preserved renal function and structure during GN. Furthermore, delayed administration of periostin antisense oligonucleotides in wild-type animals with GN reversed already established proteinuria, diminished tissue inflammation, and improved renal structure. Lack of periostin expression also blunted the de novo renal expression of integrin-β3 and phosphorylation of focal adhesion kinase and AKT, known mediators of integrin-β3 signaling that affect cell motility and survival, observed during GN in wild-type animals. In vitro, recombinant periostin increased the expression of integrin-β3 and the concomitant phosphorylation of focal adhesion kinase and AKT in podocytes. Notably, periostin and integrin-β3 were highly colocalized in biopsy specimens from patients with inflammatory GN. These results demonstrate that interplay between periostin and renal inflammation orchestrates inflammatory and fibrotic responses, driving podocyte damage through downstream activation of integrin-β3 signaling. Targeting periostin may be a novel therapeutic strategy for treating CKD. CKD is a major burden worldwide with currently no available early prognostic marker or efficient therapeutic treatment. Although various stimuli can lead to CKD, there are common mechanisms characterized by chronic inflammation and accumulation of extracellular matrix within the kidney, resulting in decline of renal function and finally, ESRD. Despite these findings, the mechanisms of induction and function of periostin in renal disease are largely unknown. In this study we investigated these mechanisms in an established chronic renal disease model induced by nephrotoxic serum (NTS) administration. We found that periostin is induced by key proinflammatory transcription factors, with the major factor being NFκB, and showed that periostin colocalizes with integrin-β3 at sites of renal damage driving activation of p-FAK– and p-AKT–dependent pathways. Finally, using a pharmacogenetic approach of in vivo antisense administration after severe proteinuria and the disease onset, we showed that inhibition of periostin can be used as a therapeutic strategy to alleviate renal disease progression. To our knowledge, we describe for the first time how periostin is induced to mediate the progression of renal disease and underline periostin targeting as therapeutic treatment against CKD. To find transcription factors that may induce periostin expression, we performed bioinformatics analysis of a 2-kb region of periostin promoter using the Genomatix software. We focused on known proinflammatory and profibrotic transcription factors and mapped their predicted binding sites on the periostin promoter sequence (Figure 1A). Periostin is upregulated by proinflammatory transcription factors in the model of NTS-induced GN. (A) Mouse periostin promoter scheme with putative transcriptions factor binding sites, as resulted by bioinformatics analysis. (B–D) Luciferase-assay results in HEK293 cells showing that both human and mouse periostin promoter activity was highly induced by p65, a NFκΒ subunit (B), and to a lesser extent by other proinflammatory transcription factors like c-Jun, STAT1, and STAT6 (C), or profibrotic transcription factors like Smad3, Smad4, and Smad5 (D). (E) Endogenous periostin mRNA expression in HEK293 cells was induced after transfection with the indicated transcription factors to a level comparable to the luciferase assay results (F–I). ChIP analysis performed in the model of NTS-induced GN, showing high enrichment of the proinflammatory transcription factors p65 (F), p-c-Jun (G), and p-STAT1 (H) on several positions of periostin promoter in vivo after NTS. On the contrary, p-Smad3, a profibrotic transcription factor, was not enriched on periostin promoter after NTS (I). For mice, n=4 per group. For cell cultures, quantifications of three independent experiments performed in triplicates are shown. *P<0.05; **P<0.01 versus control or wild-type PBS. To examine the efficiency of these transcription factors to affect periostin expression, we performed luciferase assays using 2 and 1 kb constructs of human or mouse periostin promoter, together with expression plasmids of these transcription factors. The large subunit of NFκB, p65, highly induced the activity of both human periostin promoter constructs and, even more impressively, that of mouse promoter constructs (Figure 1B). Other proinflammatory transcription factors (c-Jun, Stat1a, and Stat6) induced a two-fold increase in the activity of both human and mouse constructs (Figure 1C). In contrast, from the group of profibrotic transcription factors, only Smad4 induced a sustained two-fold promoter activity with Smad3 and Smad5, resulting in a much smaller induction of promoter activity (Figure 1D). The increase of periostin mRNA paralleled the promoter activation after transfection with the transcription factor plasmids, confirming the results of the luciferase assay (Figure 1E). We performed chromatin immunoprecipitation (ChIP) experiments to verify the in vivo binding of these transcription factors on periostin promoter in a chronic renal disease model, the NTS-induced GN. Indeed, p65 was highly enriched on its respective binding sites on periostin promoter after NTS administration (Figure 1F). p-c-Jun and p-Stat1 were also enriched on several of their predicted binding sites on periostin promoter in the NTS group (Figure 1, G and H). On the contrary, p-Smad3 was not enriched on periostin promoter after NTS, in agreement with its low efficiency to induce periostin promoter activity or mRNA expression (Figure 1I). We used periostin null mice in the C57BL/6 background and confirmed whether periostin expression was induced after NTS administration. Transcriptional and protein analysis showed increased renal expression of periostin in wild-type NTS mice compared with control littermates treated with PBS, whereas knockout (KO) mice did not display any periostin expression (Figure 2, A and B). Next, we analyzed functional and structural alterations indicative of disease progression. The increase in weight caused by edema and the severe increase of proteinuria were markedly attenuated in KO mice, showing that lack of periostin resulted in preservation of kidney function (Figure 2, C and D). Histologic examination of kidney sections stained with Masson trichrome showed that mice lacking periostin developed less fibrotic lesions and had highly preserved kidney structure together with decreased number of injured glomeruli (Figure 2, E and F). Periostin KO mice are protected from the development of NTS-induced GN. (A and B) Periostin mRNA (A) and protein (B) are increased in NTS-induced GN. (C and D) Periostin KO mice are highly protected from the increase in weight (C) and proteinuria (D) caused by NTS. (E) Masson trichrome staining showing reduced fibrosis and tissue damage in periostin KO mice (upper panels, ×200; lower panels, ×400). (F) Quantification of glomerular lesions. (G–I) mRNA expression of the fibrotic molecules COL1 (G), COL3 (H), and TGF-β1 (I) is highly decreased in periostin KO mice after NTS. (J–L) mRNA expression of the inflammatory mediators MCP-1 (J), RANTES (K), and VCAM-1 (L) is diminished in periostin KO mice after NTS. (M and N) F4/80 (M) and CD3 (N) staining showing markedly decreased accumulation of macrophages and lymphocytes, respectively, in periostin KO mice after NTS. Quantification of the staining is shown in the graphs below. mRNA and protein results from the whole kidney are shown (A, B, G–L). Animals were euthanized after 14 days of NTS administration. Scale bars, 100 μm (E, M, and N). n=6–7 per group. *P<0.05; **P<0.01 versus WT PBS or WT NTS; #P<0.05 versus WT NTS. WT, wild type. We next examined the expression of known proinflammatory mediators and fibrotic molecules, as well as the inflammatory cell infiltration profile of the diseased kidneys. Both collagens I and III and profibrotic TGF-β1 were upregulated in wild-type NTS mice, but their expression was highly attenuated in KO mice (Figure 2, G–I). In parallel, the induction of proinflammatory mediators, such as MCP-1, Rantes, and VCAM-1, in wild-type mice after NTS was completely blunted in mice lacking periostin (Figure 2, J–L). 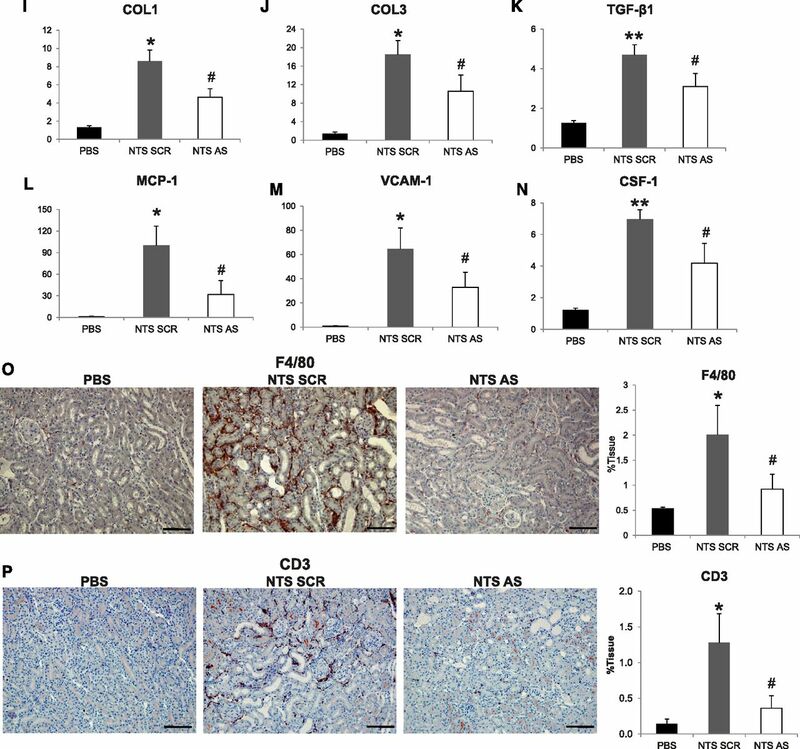 Infiltration of macrophages and lymphocytes was markedly reduced in KO NTS mice (Figure 2, M and N), establishing a close connection between periostin and inflammation probably leading to development of fibrosis and renal damage. To assess whether inhibition of periostin can be used as therapeutic approach in renal disease, we inhibited periostin expression via constant administration of antisense oligonucleotides (ODN) after induction of GN, and scrambled nonspecific ODN was used as control. Antisense administration in NTS mice efficiently inhibited the mRNA and protein upregulation of periostin (Figure 3, A and B). The renal function of NTS scrambled mice was largely compromised, characterized by high increase in weight, proteinuria, and BUN levels. These changes were reversed in mice receiving antisense: body weight and BUN increases were blunted and proteinuria was decreased to almost control levels (Figure 3, C–E). 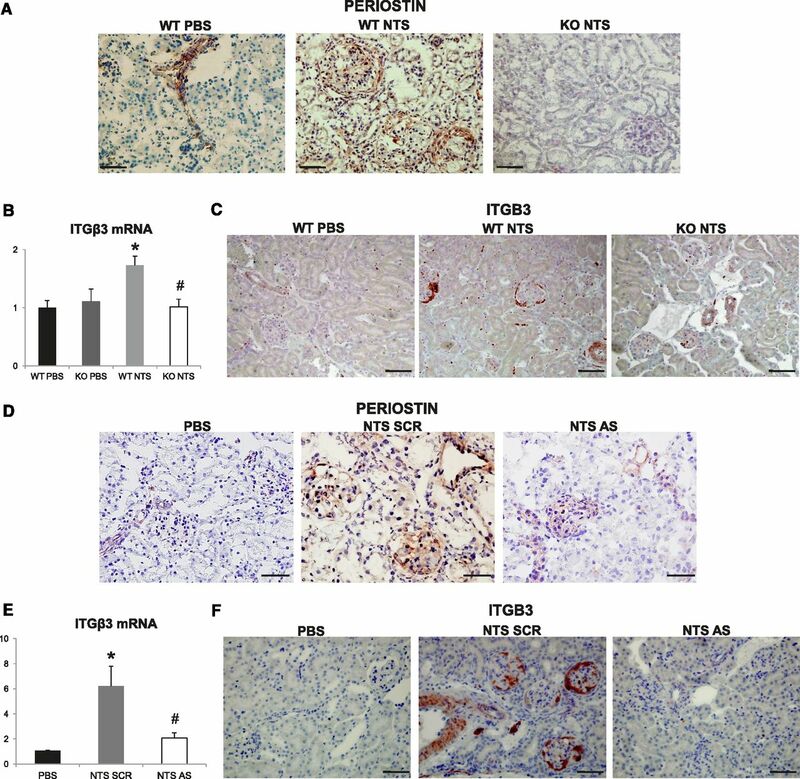 Treatment with antisense against periostin resulted in better preservation of kidney structure characterized by restricted formation of fibrotic, glomerular, and tubular lesions compared with severe structural alterations in NTS scrambled mice (Figure 3, F–H). The preservation of kidney structure and function in antisense-treated mice was accompanied by decreased expressions of profibrotic (COL1, COL3, TGF-β1) and proinflammatory mediators (MCP-1, VCAM-1, CSF-1) (Figure 3, I–N), and by lesser infiltration of macrophages and lymphocytes compared with NTS scrambled mice (Figure 3, O and P). Delayed treatment with antisense against periostin reverses the development of NTS-induced GN. (A and B) Periostin mRNA (A) and protein (B) is increased in NTS scrambled mice but is decreased in mice treated with antisense ODN. (C–E) Initiation of antisense treatment at D3 after NTS reversed the increase in weight (C), proteinuria (D), and BUN (E) observed in NTS scrambled mice. (F) Masson trichrome staining showing reduced fibrosis and tissue damage in NTS antisense-treated mice (upper panels, ×200; lower panels, ×400). (G and H) Quantification of structural glomerular (G) and tubular (H) alterations showing highly reduced crescent formation, fibrin deposition, glomerulosclerosis, and tubular dilation in NTS antisense-treated mice. 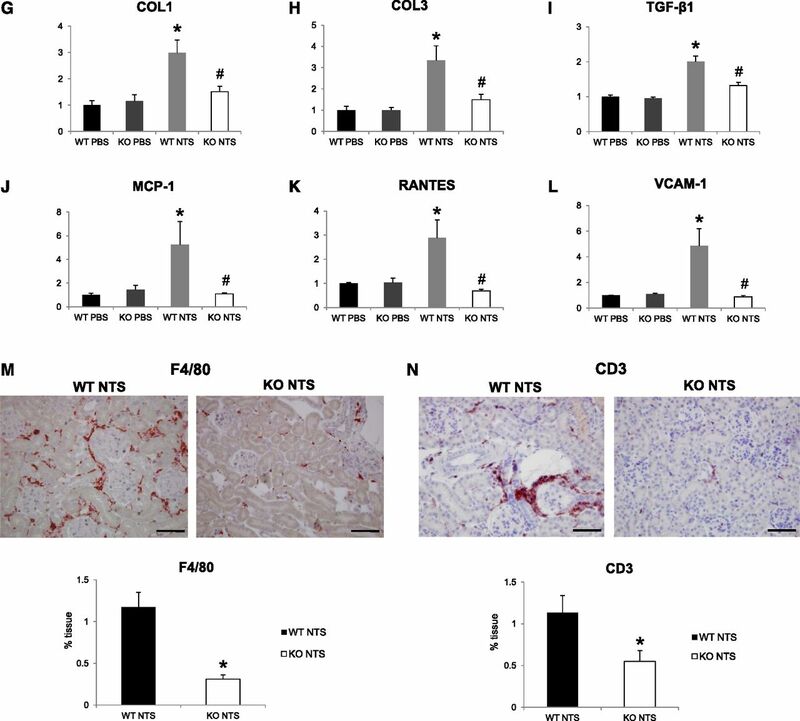 (I–K) mRNA expression of the fibrotic molecules COL1 (I), COL3 (J), and TGF-β1 (K) is attenuated in antisense-treated mice after NTS. (L–N) mRNA expression of the inflammatory mediators MCP-1 (L), VCAM-1 (M), and CSF-1 (N) is diminished in antisense-treated mice after NTS. (O and P) F4/80 (O) and CD3 (P) staining showing markedly decreased accumulation of macrophages and lymphocytes, respectively, in NTS mice treated with antisense against periostin. Quantification of the staining is shown in the graphs on the right. Animals were euthanized after 9 days of NTS administration. Scale bars, 100 μm (F, O, and P). n=5 per group. *P<0.05; **P<0.01 versus PBS; #P<0.05; ##P<0.01 versus NTS scrambled. We performed immunohistochemical analysis to localize periostin expression in the diseased kidney. In both NTS protocols, periostin showed a basic expression in control vessels and a high upregulation in vessels and injured glomeruli of damaged kidneys. Periostin expression was null in KO kidneys and highly diminished in antisense-treated kidneys (Figure 4, A and D). Interestingly, integrin-β3, a proposed periostin receptor, was de novo expressed in NTS mice, with its expression being nearly blunted in KO or antisense-treated mice (Figure 4, B and E) and was also localized in vessels and glomeruli of damaged kidneys (Figure 4, C and F). Staining of serial sections verified that integrin-β3 and periostin were coexpressed at the same sites in diseased kidneys (Figure 4G). Further double costaining with nestin or CD44 showed that both proteins are overexpressed in podocytes and activated parietal epithelial cells in the NTS model (Figure 4, H and I). On the contrary, costaining of periostin with α-SMA or CD146 did not reveal any colocalization with glomerular mesangial or endothelial cells, respectively (Figure 4I). Notably, coimmunoprecipitation analysis demonstrated that periostin interacts with its receptor, integrin-β3, in vivo during development of renal disease (Figure 4J). Periostin and integrin-β3 are colocalized at the sites of injury in the model of NTS-induced GN. (A and D) Immunohistochemical staining for periostin in WT/KO (A) and scrambled/antisense (D) mice showing increased expression of periostin in glomeruli and vessels of WT NTS mice that is absent in KO and ameliorated in antisense mice. (B and E) Integrin-β3 mRNA expression is induced in WT NTS (B) and NTS scrambled (E) mice but is highly ameliorated in KO NTS and NTS antisense mice, respectively. (C and F) Immunohistochemical localization of integrin-β3 in WT/KO (C) and scrambled/antisense (F) mice showing increased expression in glomeruli and vessels of WT NTS mice that is highly attenuated in KO and antisense mice, respectively. (G) Immunohistochemical staining of integrin-β3 and periostin in serial sections of WT NTS mice, showing localization of both proteins at the same sites (arrows indicating expression of both proteins in the same structures). (H) Double immunofluorescence for periostin (green)/nestin (red) and integrin-β3 (green)/nestin (red) in WT NTS mice, showing that both periostin and integrin-β3 are expressed by podocytes in glomeruli of NTS mice. (I) Double immunofluorescence for periostin or integrin-β3 (green) with CD44 (red) in WT NTS mice showed that both proteins are strongly expressed by activated parietal epithelial cells. Double immunofluorescence for periostin (green) with α-SMA or CD146 (red) showed no colocalization with mesangial and endothelial cells, respectively. (J) Coimmunoprecipitation analysis using anti–integrin-β3 antibody successfully precipitated both integrin-β3 and periostin, showing that the two proteins interact in vivo in the NTS model. The samples were run on the same gel but were discontinuous. Animals were euthanized after 14 or 9 days of NTS in the series of experiments with the KO (A–C) or the antisense (D–J), respectively. Scale bars, 100 μm (G) or 50 μm (A, C, D, F, H, and I). Representative images are shown. n=5–7 per group. *P<0.05 versus WT PBS; #P<0.05 versus WT NTS or NTS scrambled. To further investigate the connection between periostin and integrin-β3, we analyzed the expression of known mediators of integrin-β3 downstream signaling in the NTS model. We found that p-FAK, known for mediating cell adhesion and motility, was induced several-fold in wild-type mice after NTS, whereas its expression remained low in the KO NTS group (Figure 5A). 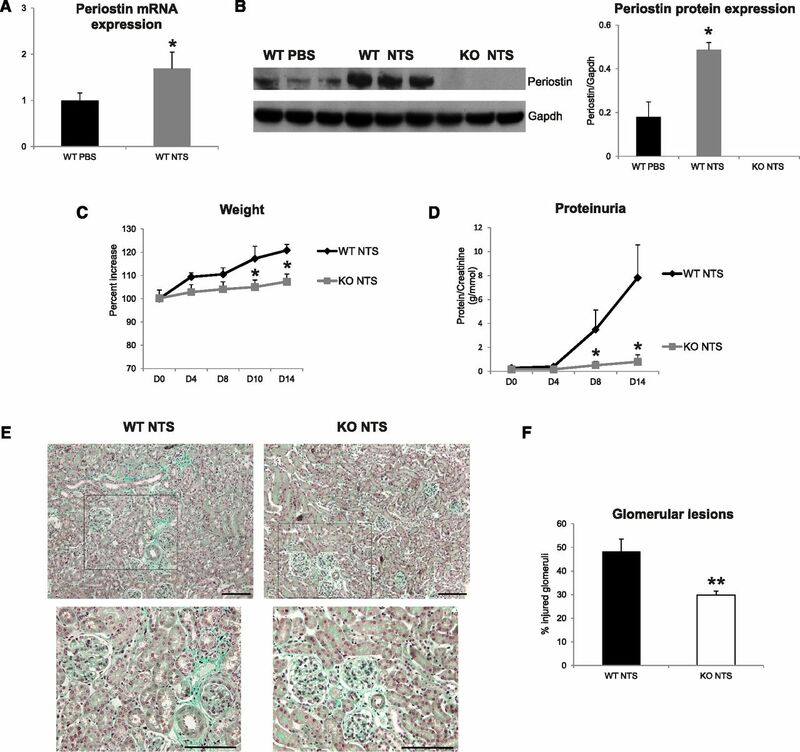 Similarly, p-AKT, a mediator of cell survival and growth, was de novo expressed in renal vessels and glomeruli after NTS, whereas its expression was negligible in KO kidneys (Figure 5B). Costaining with CD44 and nestin revealed that both integrin mediators p-FAK and p-AKT were expressed by activated parietal cells and podocytes after NTS (Figure 5C), as was shown with periostin and integrin-β3 (Figure 4, H and I). Periostin promotes integrin-β3 signaling in vivo and in vitro. (A) pFAK expression in WT/KO NTS mice is shown by Western blot. The increase in FAK phosphorylation observed in WT mice after NTS is blunted in KO mice. (B) Immunohistochemical staining of pAKT shows upregulation in glomeruli and vessels in WT mice after NTS, which is blunted in KO mice. (C) Double immunofluorescence for p-FAK and p-AKT (green) with CD44 or nestin (red) shows that both proteins are expressed by activated parietal epithelial cells and podocytes in the glomeruli of NTS mice. (D) E11 immortalized podocytes were incubated with recombinant mouse periostin (400 ng/ml) for the indicated time points and Western blot analysis was performed for integrin-β3, pFAK, pAKT, and GAPDH, with quantification graphs shown on the right. At 6 hours of periostin incubation integrin-β3 and its downstream effectors pFAK and pAKT were upregulated. (E) E11 cells were incubated for 6 hours with increasing doses of recombinant mouse periostin (400 and 1000 ng/ml), followed by Western blot analysis of integrin-β3, pFAK, FAK, pAKT, AKT, and GAPDH. Quantifications are shown on the right. pFAK and pAKT remain elevated after incubation with increasing doses of periostin. Scale bars, 100 μm (B and C). n=6–7 mice per group. Animals were euthanized after 14 days of NTS administration. For cell cultures, quantifications of three independent experiments performed in triplicates are shown. *P<0.05 versus control; **P<0.01 versus WT PBS or control. To examine whether periostin can activate integrin-β3 and its downstream signaling, we incubated an immortalized podocyte cell line, one of the cell types being injured in the NTS model, with recombinant periostin. In a time-course experiment, periostin strongly induced the expression of integrin-β3, along with its effectors p-FAK and p-AKT, with a peak at 6 hours (Figure 5, D and E). To investigate whether periostin and integrin-β3 are coexpressed in cases of human renal disease, we performed immunohistochemical localization of both proteins in consecutive sections of renal biopsies from patients with ANCA vasculitis, an inflammatory glomerulopathy. A strong staining for both periostin and integrin-β3 was observed in the examined biopsies, and the proteins were found to colocalize within damaged glomeruli and tubules (Figure 6). In addition, a comparison of gene expression profiles from renal disease datasets deposited in the publicly available platform Nephroseq revealed a strong correlation and a comparable upregulation of periostin and integrin-β3 in several of these datasets (Supplemental Figure 1, Supplemental Material). 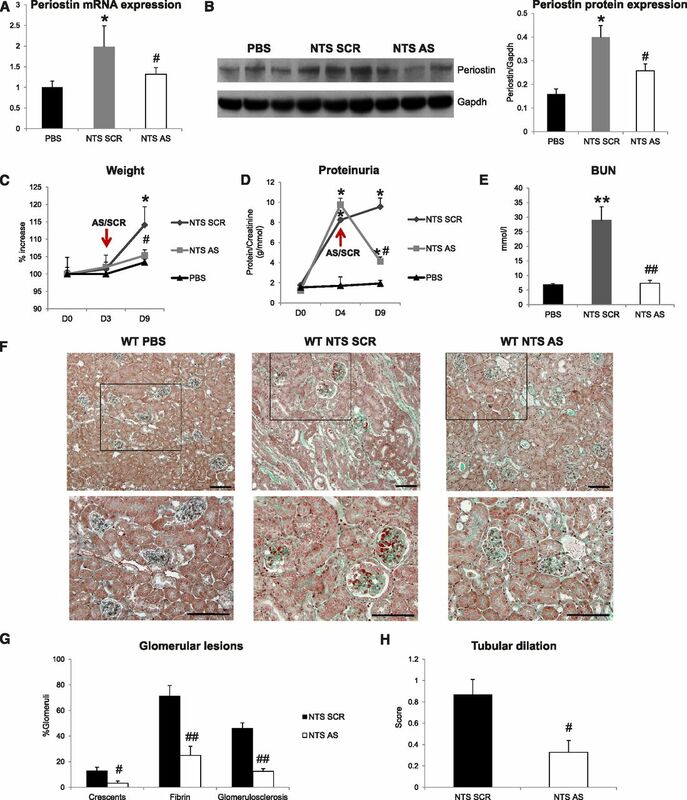 These results support the notion that periostin and integrin-β3 cooperate to mediate the development of renal disease. Periostin and integrin-β3 are coexpressed in human renal biopsies. (A) Immunohistochemical staining of integrin-β3 and periostin in consecutive sections from a biopsy specimen of a patient with ANCA vasculitis, depicting a strong expression and a high degree of colocalization between periostin and integrin-β3 both in damaged glomeruli and tubules. (B) Magnified images of the panels drawn in (A), showing in more detail the coexpression of periostin and integrin-β3 in damaged glomeruli and surrounding tubules. Arrows indicate colocalization sites. Scale bars, 100 μm (A) or 30 μm (B). Representative images are shown. The increasing prevalence of CKD and the lack of efficient treatment necessitate the discovery of novel prognostic markers and therapeutic targets. Periostin, a matricellular protein associated with mesenchymal phenotype and fibrous structures, was found by us and other investigators to be highly induced in the kidney in several types of renal disease, both in animal models and patient biopsies.16,17 Nevertheless, the mechanism(s) of induction and the actual role of periostin during disease progression have not been examined. This study aimed to unravel these mechanisms in an established model of NTS-induced renal disease. Our results showed for the first time that proinflammatory transcription factors induce periostin in renal disease. Moreover, periostin was found to drive both the expression and downstream signaling of integrin-β3, a proposed periostin receptor, causing phenotypical changes associated with disease progression. Finally, we showed that delayed in vivo inhibition of periostin after the disease onset can efficiently alleviate the progression of severe renal disease. The proposed mechanisms of induction and function of periostin in renal disease are summarized in Figure 7. Proposed mechanism of how periostin mediates renal damage. Proinflammatory transcription factors, with the major factor being NFκΒ, induce expression of periostin, which activates integrin-β3, inducing integrin downstream signaling and leading to cell motility, survival, and podocyte foot process effacement. In parallel, periostin promotes the tissue expression of several chemokines (MCP-1, RANTES, VCAM-1, and CSF-1) and profibrotic molecules (COL1, COL3, and TGF-β1), inducing inflammatory cell infiltration and matrix stabilization, and podocyte damage further amplifies these effects, causing a vicious circle. Activation of integrin avβ3 in podocytes has been shown to mediate podocyte dysfunction, motility, and proteinuria in FSGS and LPS-induced renal disease.33,34 In the NTS model, induction of integrin-β3 and its downstream signaling in parietal cells and podocytes was dependent on the expression of periostin. Treatment of cultured podocytes with recombinant periostin was sufficient to increase integrin-β3 expression followed by FAK and AKT activation. Activation of FAK and AKT in the injured podocytes and activated parietal cells induces cell motility, invasion,35 and crosstalk between the two glomerular cell types, resulting ultimately in foot process effacement, proteinuria, and kidney damage. We found strong expression and a high degree of colocalization between periostin and integrin-β3 in renal biopsies from patients with ANCA vasculitis. In addition to their glomerular expression, both proteins were also localized in tubular cells in the human biopsies. This difference with the NTS model may reflect the distinct stimuli causing the disease, which in the case of the NTS model, target primarily the glomerulus, whereas they affect the whole kidney in the case of ANCA vasculitis. To further investigate the coexpression pattern of periostin and integrin-β3 in patients with renal disease, we performed a meta-analysis of gene expression profiles from renal disease datasets deposited in the Nephroseq platform (www.nephroseq.org). We compared the expression levels of periostin and integrin-β3 in a similar disease dataset as the biopsies used in our study (patients with vasculitis versus healthy donors, n=52), and found a strong correlation between periostin and integrin-β3 (R=0.54, P<0.001). Moreover, both proteins were significantly upregulated to a comparable level in several other datasets (Supplemental Figure 1). Presently, only two studies in animal models of pulmonary fibrosis and ovarian cancer have shown that inhibition of periostin via blocking antibodies could be used as a therapy against the disease progression.28,36 We used an alternative strategy of in vivo antisense administration after establishment of severe proteinuria and found that inhibition of periostin could remarkably diminish the inflammation and reverse the increase in proteinuria. The ability of periostin to play distinctive roles in crucial events during development of renal disease by promoting tissue inflammatory response, accumulation of extracellular matrix and podocyte damage underline periostin targeting as a potential efficient future treatment against CKD. All procedures and use of human tissue were performed according to the national ethical guidelines and were in accordance with the Declaration of Helsinki. Written informed consent was given by the patients for use of part of their biopsy specimen for scientific purposes before inclusion in the study. Renal biopsies from patients were retrospectively analyzed. Experiments were performed on biopsies from patients with ANCA vasculitis. The biopsies were characterized by diffuse glomerular lesions, fibrin deposits, weak lesions of acute tubular necrosis, and extracapillary crescentic proliferation. Formalin-fixed, paraffin-embedded consecutive kidney sections (4-µm thick) were stained with primary antibodies for periostin (ab14041; Abcam, Inc., Cambridge, MA) or integrin-β3 (ab75872; Abcam, Inc.). Appropriate secondary antibodies (N-Histofine; Nichirei Biosciences) and AEC (Dako) as substrate were used. Slides were counterstained with hematoxylin QS (Vector Laboratories, Burlingame, CA) and mounted with permanent aqueous mounting medium (ScyTek). Biopsies from four patients were used for this set of experiments. All procedures regarding animal experimentation were in accordance with the European Union Guidelines for the Care and Use of Laboratory Animals and approved by the local ethics committee of the National Institute for Health and Medical Research (Institut National de la Santé et de la Recherche Médicale). Animals were housed at constant temperature with free access to water and food. The strain of periostin KO mice was created at the laboratory of Dr. Simon Conway and has been previously described.15 For the model of NTS-induced GN, decomplemented NTS was prepared as previously described.37,38 Female wild-type and KO littermate mice of the C57BL/6 background (8–10 weeks old) received intravenous injections of 15 µl NTS per g body wt over two consecutive days (days 0 and 1) to induce crescentic GN. Control mice were injected with PBS. Mice were euthanized 14 days after the first injection (n=6–7 per group). Blood, urine, and renal tissues were collected for subsequent analyses. For the antisense experiments, SV129 male wild-type mice aged 8–10 weeks were used. The mice received intravenous injections of 12 µl NTS per g body wt over two consecutive days (days 0 and 1) to induce crescentic GN, whereas control mice were injected with PBS. Periostin expression was inhibited with a cocktail of two different ODNs specifically targeting periostin mRNA, designed using the Integrated DNA Technologies platform, also previously described.15 Scrambled nonspecific ODNs were used as control. The ODN sequences were modified with phosphorothioate to prevent their in vivo hydrolysis by nucleases (Sigma-Aldrich, St. Louis, MO; Supplemental Table 1). For administration, the ODNs were diluted in normal saline and placed in osmotic mini-pumps (model 1002; Alzet, Cupertino, CA), which were subsequently implanted subcutaneously, constantly releasing a dose of 0.25 µl/h corresponding to a release of 150 pmol of ODN per day. The implantation of mini-pumps was performed at day 3 after administration of NTS, taking 1 day for the pump to start functioning. Mice were euthanized 9 days after the first injection (n=5 per group). Blood, urine, and renal tissues were collected. Urine was collected at several time points during the mouse protocols and blood was collected at the end of each protocol. Proteinuria was measured using a Konelab analyzer (Thermo Fisher Scientific, Vernon Hills, IL), and was normalized to urine creatinine. BUN levels were measured with an enzymatic method (Konelab analyzer) and expressed in millimoles per liter. Formalin-fixed, paraffin-embedded, 4-µm thick kidney sections were stained with Masson trichrome. Quantifications were performed by examining at least ten microphotographs of random, nonoverlapping fields at 200× magnification per mouse. Crescents, fibrin deposits, and glomerulosclerosis were expressed as percentage of the total glomeruli evaluated. Tubular dilation was examined using a zero (no dilation) to three (high dilation) injury scale per photograph and the mean value was calculated for each mouse. The evaluation of glomerular injury on the resistant C57BL/6 background was on the basis of the combined examination of mesangial matrix expansion, endothelial wall thickening, capillary rupture, and glomerular infiltration and was expressed as percentage of injured glomeruli per total glomeruli examined. Proteins from half kidneys or cell culture were extracted in a commercial RIPA lysis buffer supplemented with PMSF, a protease inhibitor cocktail and sodium orthovanadate (Santa Cruz Biotechnologies, Santa Cruz, CA), and total protein concentration was measured using the Bradford assay. Equal amounts of proteins were loaded on a NuPAGE 4%–12% gradient gel (Invitrogen, Carlsbad, CA) and transferred to nitrocellulose membrane (Bio-Rad, Hercules, CA). Immunoblotting was performed for periostin (MOSF20; R&D Systems, Minneapolis, MN), integrin-β3 (ab75872; Abcam, Inc.), pFAK (#3283; Cell Signaling Technology, Danvers, MA), FAK (sc-557; Santa Cruz Biotechnologies), pAKT (#9271; Cell Signaling Technology), and AKT 1/2/3 (sc-8312; Santa Cruz Biotechnologies). Gapdh (Sigma-Aldrich) was used as loading control. Total RNA was extracted from half kidneys using TRI Reagent (MRC) and from cell cultures using the EZ-10 Spin Column Total RNA Mini-preps Super kit (Bio Basic Inc). RNA quality was verified by measuring the OD 260:280 ratio and residual genomic DNA was removed by DNase I treatment (Thermo Fisher Scientific) for 30 minutes at 37°C. A total of 1 µg RNA was transcribed to cDNA using the Maxima First Strand cDNA Synthesis Kit from Thermo Fisher Scientific per manufacturer’s instructions. Real-time PCR was performed with the Roche Light Cycler 480 detection system using SYBR Green PCR Master Mix (Roche Diagnostics, Indianapolis, IN). Specific primers for target mRNAs (Supplemental Table 2) were used for amplification under the following program: 95°C for 5 minutes, 45 cycles at 95°C for 15 seconds and 60°C for 15 seconds, and 72°C for 15 seconds. For quantitative analysis, experimental genes were normalized to Gusb mRNA or Hprt mRNA expression using the ΔΔCT method. Dissociation curves were analyzed in order to determine that a single product was amplified. For immunostaining of macrophages and lymphocytes, 4-µm thick formalin-fixed, paraffin-embedded kidney sections were stained with primary antibodies to F4/80 (MCA497R; Abd Serotec) or CD3 (A0452; Dako), respectively. Appropriate secondary antibodies (N-Histofine; Nichirei Biosciences) and AEC (Dako) as substrate were used. Slides were counterstained with hematoxylin QS (Vector Laboratories) and mounted with permanent aqueous mounting medium (ScyTek). The F4/80 and CD3 positive area was quantified in at least ten photographs at 200× magnification per animal, using publicly available image processing software (ImageJ; Fiji), and expressed as percentage of the total tissue area. For periostin immunostaining, 5-µm frozen tissue sections were fixed in 4% PFA for 15 minutes, blocked in 10% FBS, and incubated with primary anti-periostin antibody (PA5–34641; Thermo Fisher Scientific). Integrin-β3 (ab75872; Abcam, Inc.) and p-AKT immunostainings (ab81283; Abcam, Inc.) were performed on 4-µm formalin-fixed, paraffin-embedded kidney sections. Incubation with secondary antibodies and signal detection was performed as described above. Dual immunolabeling was performed on 5-µm frozen or 4-µm paraffin tissue sections incubated with primary antibodies to periostin, integrin-β3, nestin (556309; BD Pharmingen), CD44 (11–624-C100; Exbio), α-SMA (A5228; Sigma-Aldrich), CD146 (kind gift from Professor Françoise Dignat-George), pAKT and pFAK (ab55335; Abcam, Inc.). The signal was detected with Alexa Fluor –488 and –546 secondary antibodies followed by DAPI counterstaining and mounting in PermaFluor medium (Thermo Fisher Scientific). The E11 immortalized mouse podocyte cell line was cultured as previously described.17 Briefly, cells were maintained in RPMI 1640 medium supplemented with 10% FBS, 100 U/ml penicillin streptomycin, and 10 U/ml recombinant mouse INFγ (Peprotech) to induce synthesis of the immortalizing T antigen at 33°C and 5% CO2. To initiate differentiation, cells were trypsinized and thermoshifted to 37°C in medium without INFγ for 10–15 days. For treatment with recombinant mouse periostin, differentiated cells in six-well plates were serum starved for 24 hours and incubated with recombinant periostin (R&D Systems) at a concentration of 400 or 1000 ng/ml for the indicated time points. The HEK293 cell line was maintained in DMEM 4.5 g/L glucose supplemented with 10% FBS, 100 U/ml penicillin streptomycin, and 2 mM l-glutamine at 37°C/5% CO2. Transfection was performed in 12-well plates via the CaCl2 method. Briefly, 2 hours before transfection, cells were replenished with fresh culture medium. Each well was transfected with a mixture of 0.35 µg pGL3 plasmid, 0.35 µg CMV–β-galactosidase plasmid (used for normalization), and 1.25 µg transcription factor expression plasmid added to 14 µl 2 M CaCl2 and 111 µl 2× HBS solution (Sigma-Aldrich) in a final volume of 222 µl. The day after transfection, cell medium was replaced with fresh medium and the cells were incubated for another day before being tested in the luciferase assay or subjected to RNA extraction followed by quantitative real-time PCR. The pGL3-basic luciferase reporter vector (Promega, Madison, WI), the CMV-β-galactosidase expression plasmid, and the expression plasmids for Smad3, Smad4, and Smad5 were kindly provided by Dr. A. Charonis (Biomedical Research Foundation of the Academy of Athens). Expression plasmids for RelA/p65 (#21984), c-Jun (#47443), Stat1a (#8690), and Stat6 (#35482) were obtained from Addgene. PUC19 encoding for an inactive fragment of β-galactosidase was used as control plasmid for transfection. The human and mouse periostin promoter regions hProm 2 kb (−2003+113), hProm 1 kb (−888+113), mProm 2 kb (−2037+20), and mProm 1 kb (−876+20), taking +1 as the transcription start site, were amplified by PCR from human or mouse DNA and cloned into the multiple cloning site sequence of pGL3-basic vector. The translation start site (ATG) for the human and mouse periostin gene is at +119 and +35 after the transcription start site, respectively. Bioinformatics analysis of human and mouse periostin promoters was performed by the Genomatix software (www.genomatix.de). The desired promoter sequence was retrieved by the Genomatix database using the tool Gene2Promoter followed by multiple alignment to check for conserved sequences and detection of putative transcription factor binding sites per sequence similarity. For luciferase activity measurement, the Luciferase Assay System from Promega (E4030) was used according to manufacturer’s instructions. Briefly, the cells were lysed in Reporter Lysis Buffer, the extract was collected after centrifugation and removal of cell debris, and luciferase activity was measured immediately in a luminometer after mixing 15 µl extract with 70 µl Luciferase Assay Reagent. To normalize luciferase measurements, the activity of β-galactosidase was measured in a β-galactosidase assay. For each sample, 30 µl cell extract were mixed with 3 µl magnesium solution (0.1 M MgCl2, 4.5 M β-mercaptoethanol), 66 µl ONPG (substrate), and 201 µl sodium phosphate (pH 7.5) and incubated at 37°C for several minutes until the development of a faint yellow color. The reaction was stopped by addition of 1 M Na2CO3 and absorbance was measured at 420 nm. The results were expressed as the ratio of the relative luciferase units to β-galactosidase measurements. ChIP was performed in kidneys from wild-type SV129 mice injected with NTS or PBS (control), using the SimpleChIP Plus Enzymatic Chromatin IP Kit (#9005; Cell Signaling Technology) per manufacturer’s instructions. Briefly, whole kidneys were finely minced and crosslinked with 1.5% formaldehyde for 20 minutes under constant rotation, followed by addition of 0.1 M glycine to stop the reaction. The tissue was disaggregated using a Dounce homogenizer, nuclei were prepared, and chromatin was digested, sonicated, and analyzed by gel electrophoresis and OD260 measurement to determine DNA concentration. Precipitation was performed with the following ChIP-graded antibodies from Cell Signaling Technology: NF-κB p65 (#8242), p-c-Jun (#3270), p-Stat1 (#7649), and p-Smad3 (#9520). Rabbit IgG was used as control. The precipitated complexes were purified with the use of Protein G Magnetic Beads, crosslinks were reversed, and DNA was eluted and purified. Sequence-specific primers for selected regions of mouse periostin promoter (Supplemental Table 3) were used in subsequent quantitative real-time PCR analysis to check for enrichment of precipitated DNAs in the NTS over the PBS group. The results were expressed as percentage of the input (total DNA used for immunoprecipitation). Protein interactions were stabilized by crosslinking minced half kidneys with DTSSP (#21578; Thermo Fisher Scientific) per manufacturer’s instructions. Proteins were extracted in Pierce IP lysis buffer (#87787) supplemented with PMSF, a protease inhibitor cocktail, and sodium orthovanadate, and total protein concentration was measured using the Bradford assay. Equal amounts of proteins were precipitated with a rabbit anti–integrin-β3 antibody (ab119992; Abcam, Inc.) and rabbit IgG was used as a control. The precipitated complexes were purified with the use of Protein G Magnetic Beads (#8740; Cell Signaling Technology) and loaded on a denaturating SDS-PAGE followed by Western blotting. Equal amounts of input were also loaded on the same gel. Immunoblotting was performed for periostin (MOSF20; R&D Systems) and the membrane was stripped using Restore Western Blot Stripping Buffer (#21059; Thermo Fisher Scientific) and reblotted for integrin-β3 (ab75872; Abcam, Inc.) and Gapdh (Sigma-Aldrich). Veriblot was used for immunoprecipitation analysis of secondary antibody (ab131366; Abcam, Inc.), preferentially detecting the nonreduced form of IgG to avoid nonspecific signals from coeluted reduced forms of the antibodies used for immunoprecipitation. Data are expressed as mean±SEM. Data were analyzed using one-way ANOVA followed by a Fisher test. Values of P<0.05 were considered significant. We thank Dr. Aristidis Charonis and Dr. Panagiotis Politis (from Biomedical Research Foundation of the Academy of Athens) for providing plasmid expression vectors. We also thank Dr. Nicole Endlich for providing the podocyte cell line and Caroline Martin for valuable help with animal breading. The CD146 antibody was a generous gift from Professor Françoise Dignat-George. This work was supported by grants from the Institut National de la Santé et de la Recherche Médicale. N.P. was the recipient of a long-term fellowship from the Society of European Renal Association-European Dialysis and Transplantation. This article contains supplemental material online at http://jasn.asnjournals.org/lookup/suppl/doi:10.1681/ASN.2016070709/-/DCSupplemental.